Big Break is an online video slot machine game released in February 2008. It is offered exclusively at online casinos powered by Microgaming. This video slot game has 5 reels and 15 pay lines. 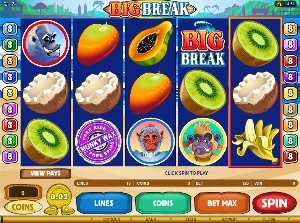 The theme of Big Break is all about different kinds of monkeys who are enjoying the beach by surfing across the waves and eating tropical fruits. It’s probably not new to you when you see a dog riding a surfboard, but have you ever seen a monkey ride the wicked waves like a pro? At the Big Break online slot game, you will definitely see not one, but five different types of monkeys who are all pros when it comes to surfing. A lot of online slots players love the relaxing tropical music, the brightly-colored symbols, and most especially the bonus games that can give lots of bonus prizes once you successfully enable them. Microgaming online slot games are available to players in 2 formats – download and no-download. Whether you like to download their software first or you prefer to play instantly without the need to download, then Microgaming surely has online slot machine games to accommodate your every slot gaming preference. Good thing that Big Break is available for instant play, so you do not have to download anything to find out if this game interests you in a way that you would like to spend some real money on it. Big Break is created for players who love to spend their summer days at the beach, watch the waves, feel the breeze on their skin, get a tan the natural way, eat tropical fruits, enjoy the waves and absolutely have fun while earning cool cash! The Big Break online video slot game features scatter wins, a wild symbol, a Wild multiplier symbol, a Free Spin Bonus Feature game, the Surf’s Up Bonus Feature game, a maximum coin jackpot of 20,000, and a maximum cash jackpot of $10,000! The quality of the graphics and sound that Microgaming provides is absolutely fantastic and top notch. They have an impeccable reputation of making the most stunning graphics and true-to-life sound effects that will truly transport you to “that specific theme” they used in any of their slot games. Most people love to play games incorporated with Microgaming software because they have smooth animation and engaging yet non-interfering sounds. In Big Break, they bring players to the cool and breezy beach, with wild waves waiting to be tamed by the game’s highly-experienced “monkey” surfboard riders! The symbols are drawn in a semi-cartoonish fashion, and the tropical fruits are drawn accurately and vibrantly. You will definitely play here for a long time because it will not hurt or strain your eyes. Cool and funny animated programming is used on the symbols when you successfully hit winning combinations. The overall graphic design of Big Break displays the vibrant colors of a typical tropical beach, with the top of the reels containing some mountains, palm trees, surfboards and tiny huts while at the bottom of the reels, you can see the sandy beach shore and the water just at the middle part of the reels. When you successfully trigger the Free Spin Bonus Feature game, the whole blue coloring of the background reels will become bright orange, clearly showing that the sun is already setting while you play your Free Spins. After your Free Spins, your winnings will be displayed on a box with a background of the beach at nighttime, which is totally cool! You should really play this game so that you could appreciate it firsthand. The constant background music you will hear in this game is sort of “tropical” with drums and flutes, and you can also hear the faint splashing sound of the waves from the beach. Varying celebratory sounds will be heard when you hit winning combinations with different symbols. If you trigger the Free Spin Bonus Feature game, the music will become more upbeat and the sounds of the drums will be much prominent, making you feel more excited as the Free Spins are played out and give you cool rewards without the extra cost! There are no card deck symbols available in the Big Break online video slot game. The regular symbols that you will find in Big Break are the primates such as the Gorilla, Gibbon, Lemur, Macaque, and Orangutan; other symbols are fruits such as the Coconut, Papaya, Kiwi, Mango, and of course, Bananas. There are actually two Wild Symbols in the Big Break online video slot machine game: the Big Break wild symbol, and the Lucky Break wild multiplier symbol. • The Wild Symbol is the Big Break symbol. The Big Break wild symbol acts as a substitute for all symbols (except for the Lucky Break wild symbol, the Munky Wax scatter symbol, and any animal symbol that can activate the Surf’s Up Bonus Feature game) in order to help you complete winning combinations. The Big Break wild symbol can substitute for the following symbols to form winning combinations – Gorilla, Macaque, Lemur, Orangutan and/or Gibbon symbols. Please take note that there are no winnings gotten from any Big Break symbol combinations. You are paid a scatter award if any two or more Gorilla, Macaque, Lemur, Orangutan or Gibbon symbols appear scattered from left to right on adjacent reels while playing the Free Spin Bonus Feature game. • The Wild Multiplier symbol is the Lucky Break symbol. The Lucky Break wild multiplier symbol not only acts as a substitute for all other symbols (except for the Scatter symbol) in order to you help you form winning combinations, but it also can multiply the payout! The Lucky Break wild symbol doubles (multiplier x2) the payout of any winning combination it completes, as long as it acts as a substitute symbol. The Lucky Break symbol only appears on the 5th reel. Please take note that there are no winnings gotten from any Lucky Break symbol combinations. If there is more than 1 possible regular winning combination on an active pay line, you are awarded for the highest combination only. However, if a Lucky Break symbol winning combination also is present on the same pay line, you are awarded for both of these winning combinations. The symbols cannot be shared between 2 winning combinations on a pay line even when a right-to-left symbol combination appears. The Scatter Symbol is the Munky Wax. The scatter symbol is not required to appear in a line (on an enabled pay line) for you to win. The Munky Wax scatter symbol can be found scattered anywhere on the 5 reels, and you are able to form winning combinations as long as there are 2 or more Munky Wax scatter symbols that appear. Your winnings are calculated by multiplying the Munky Wax scatter symbol combination payout (refer to the Payout table) by the total number of coins you’ve bet. If you manage to get 3 or more Munky Wax scatter symbols, you will trigger the Free Spin Bonus Feature game. Please take note that if you get a scatter win and a regular win, then you are paid out for both of these wins, because the Munky Wax scatter symbol is not required to come out on an enabled pay line for you to win. Scatter awards are independent from pay line awards, and thus they are added to the pay line win. If you manage to get 3 or more Munky Wax scatter symbols anywhere on the 5 reels, you will activate the Free Spin Bonus Feature game. You will begin playing the Free Spin Bonus Feature game with 15 Free Spins, and as long as you are playing these Free Spins, the following symbols act as scatter symbols to help you complete scatter winning combinations: Gorilla, Gibbon, Lemur, Macaque and Orangutan symbols. These symbols are not required to come out in a line (on an enabled pay line) for you to win. These can be found scattered anywhere on the 5 reels, and you can form winning combinations as long as you get 2 or more of these symbols displayed from left to right on consecutive reels. While playing the Free Spin Bonus Feature game, you can re-trigger the Free Spins by just getting 3 or more Munky Wax scatter symbols (anywhere on the reels), which will award you another set of 15 Free Spins! The additional Free Spins are included to your remaining number of Free Spins. There is an infinite amount of Free Spins that you can win during the Free Spin Bonus Feature game. Please take note that you cannot activate the Surf’s Up Bonus Feature game while playing the Free Spin Bonus Feature game. Once the Free Spin Bonus Feature game is over, you will be then taken back to the main Big Break online slot game, and your winnings from the Free Spin games will be added to your overall balance. Any Gibbon, Gorilla, Lemur, Macaque and Orangutan scatter symbols that can be found scattered anywhere on the 5 reels on 1 spin will activate the Surf’s Up Bonus Feature game. In the Surf’s Up Bonus Feature game, there will be 5 surfboards that are shown. To activate the Surf’s Up Bonus Feature game, simply click the “Start” button. A highlighter will be circling along the 5 surfboards. To stop the highlighter, click the “Stop” button and it will land on one of the surfboards. Each surfboard contains a random bonus prize value. The number of coins bet per payline already multiplies the bonus prize amount won in the Surf’s Up Bonus Feature game. If you want to skip the bonus count up, simply click on the winning surfboard. You can win up to 7,500 coins in the Surf’s Up Bonus Feature game. Once the Surf’s Up Bonus Feature game is over, you will be then taken back to the main Big Break online slot game, and your winnings from the bonus game will be added to your total balance. Big Break has 5 reels where you may bet on 15 pay lines. The minimum bet is 0.01 up to 0.50 per pay line. You can wager 1 up to 10 coins per pay line bet. Therefore, the maximum bet amount is 75.00 per spin. Please take note that the amounts mentioned are in Pounds, but they will remain the same if you choose to play in US dollars, Euros, or Canadian dollars. Also, for every coin that you wager, you will enable another pay line. You will be paid out for winning combinations on enabled pay lines only. The maximum payout in the standard Big Break online video slot game is 1,000 coins per line bet. Those who often play online casino games naturally love to stay longer on online slot games that have an Autoplay function. Good thing that Big Break is furnished with this function! In Microgaming online slot games, they have 2 game modes – Regular mode and Expert mode. You can have the game spin automatically for you with the Autoplay function that can be found by clicking the Expert button (if you look closely at the brown line at the bottom part of the game screen, you will see the Expert button just below the Bet Max button). After customizing the Autoplay function to your preferences, just click on the Start button, and the game will automatically spin for you while you just sit back, relax, and enjoy playing this happy-go-lucky surfing primates-themed online video slot game!